Remote Mitte (Tour in English) – 30.04.2019 16:00 @ Maxim Gorki Theater | ASK HELMUT – Best time out in Berlin. In online games, people that have never met in reality go on virtual treasure hunt together. In Remote Mitte the audience heads out into the real city with wireless headphones. They are led by an artificial voice, familiar from navigation systems or from computer-aided phone services. This encounter with an artificial intelligence leads the group to experiment on itself. How can we make decisions together? Who do we follow when we let ourselves be guided by a computer program? 50 people are watching each other, making individual decisions, and yet they are part of a group at the same time. Even though the artificial intelligence observes human behavior from a distance, her voice sounds more human with every step. She leads the group from the periphery to the center. 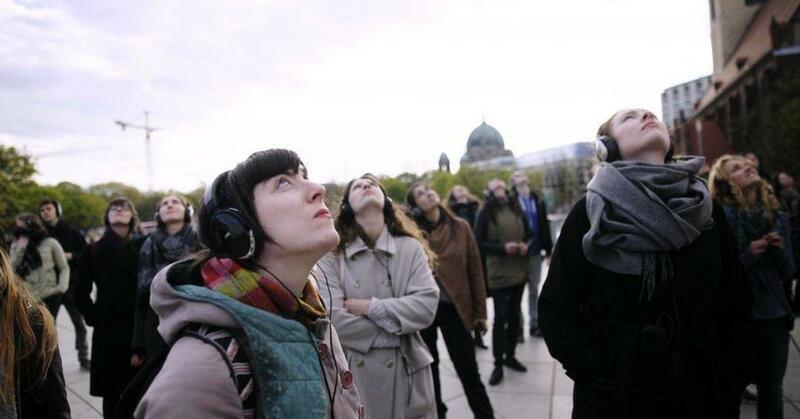 Along the way, artificial binaural recordings and cinematic compositions set the urban landscape to music. The journey through the city becomes a collective film. Remote X raises the question of artificial intelligence and our own predictability, and moves from city to city as a mobile research laboratory. What began in 2013 as Remote Berlin in cooperation with HAU Hebbel am Ufer has been further developed since then, in cities such as Avignon, Bangalore, Moscow, New York, São Paulo, Abu Dhabi, in 28 site-specific variations. Each new site-specific version builds on the dramaturgy of the previous city. After more than 700 performances worldwide, the project Returns to Berlin and interrogates in a new edition on behalf of the Maxim Gorki Theater, the German capital at its center: Mitte. Bicycles cannot be taken on the tour. The tour ends at Hackescher Markt. Please use public transport for arrival and departure. Tour available in English every day. The start and end points of the tour are not the same. Please arrive at the start point at least 15 minutes early. Please bring an ID card or similar as a deposit for your headphones. The audio tour will take about 120 minutes (no intermission). Longer walks are part of the event. The event is not handicapped accessible.